The Wishbass Fretless Bass | Gear Acquisition Syndrome!! My Wishbass looks like an amoeba. As you can see by the pic on the left, my particular Wishbass is quite… well, different is one way to start the discussion. Luckily, it doesn’t sound as peculiar as it looks. So for those of you unacquainted with the Wishbass company, let’s expand our brains a bit, shall we?! 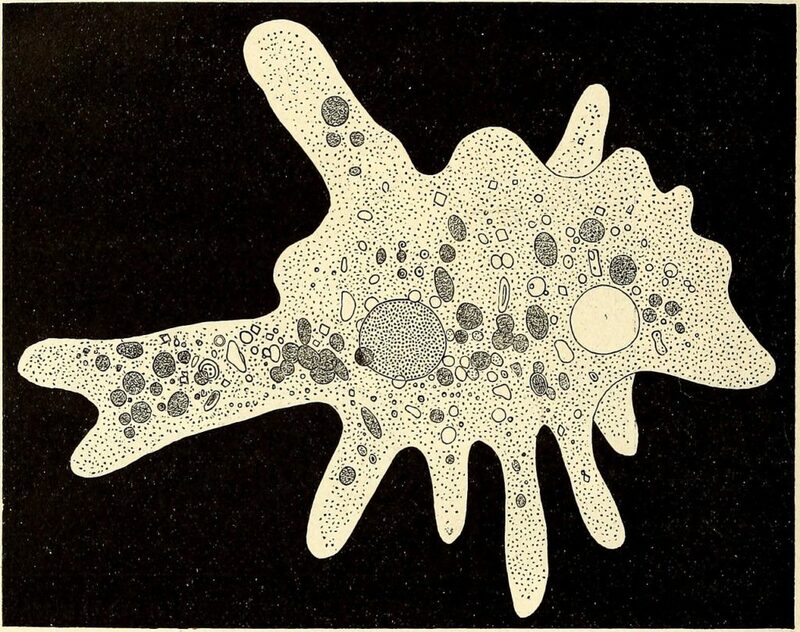 Did you get to investigate amoebas in high school Biology like I did? Such weird, amorphous-looking creatures… so bizarre-looking! … I watched it eat. Ohhhh…. the horror!! It came upon an unsuspecting paramecium. Out crept it’s surreptitious arm-like psuedopods… slowly starting to envelop the leisurely critter without a sound. Within seconds, the paramecium too late recognized the threat! It started to swim around fast and frenetic, slamming in panicked circles against its foe!! But the rubber arms of the “Mrs. Incredible” of single-celled organisms only tightened the embrace. There was no way out. The “bubble of death” was complete. Then all was still… in the vacuole of death!!! Funny, but when I first saw my Wishbass in pictures in an ad on Craigslist, all those moving amoeba memories came flooding back in to my conscious thought. It didn’t come across quite as grisly as that hungry amoeba in high school though. Like lunch-luscious parameciums to an amoeba’s survival instinct… I knew when I saw this bass that it had to be mine!! It was the only way to escape the vacuole of G.A.S. that had enveloped my brain! 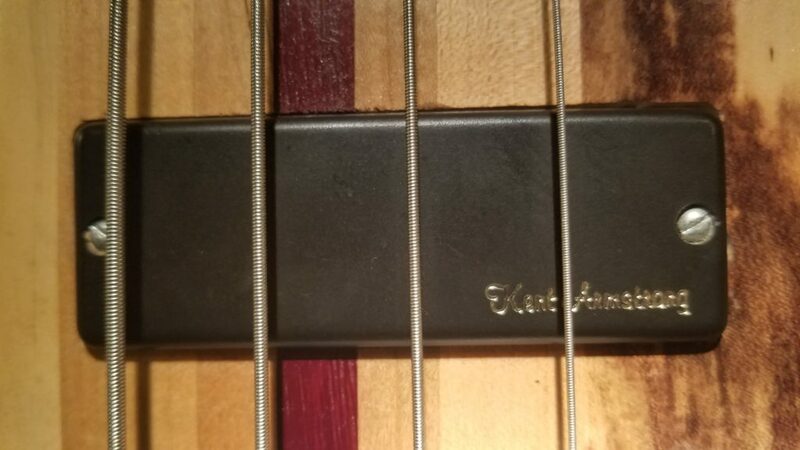 My Debt’s Less For Fretless! 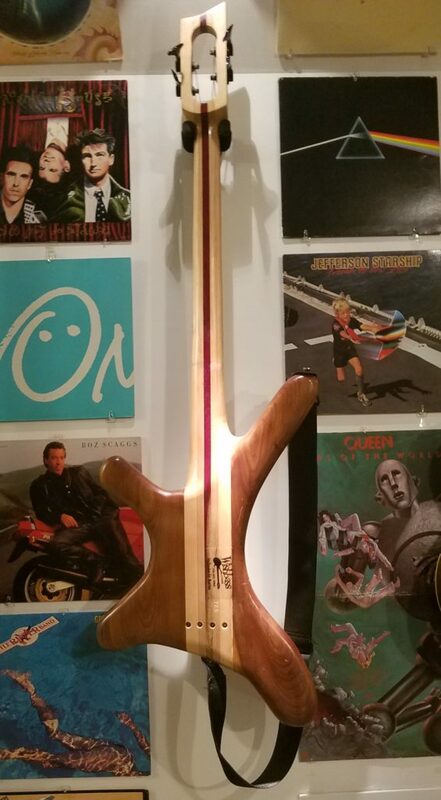 When I saw this bass in the ad, obviously the shape and look of the body grabbed my attention and wouldn’t let go. But it was also the COST listed in the ad that made me jump like Eddie Van Halen during the “1984” tour! It was listed for $150! Now, I’d been in the market for a fretless for some years, and this price was… well, a little to low to believe. But I had to check it out. So, I went over to the guy’s pad and played it through his amp. Wow. Weird shape, but FULL sound. No buzzing, short-outs or pot crackle at all. Just solid bass whomp. 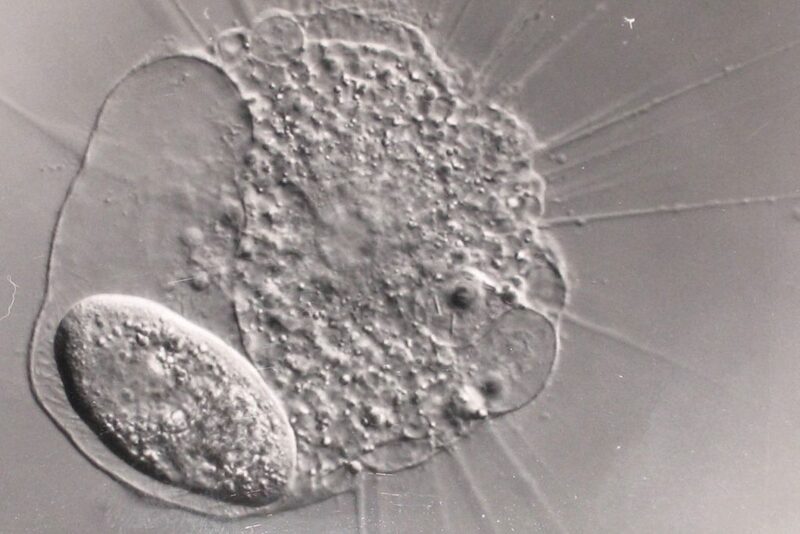 An Amoeba That’s Truly “Kewel”! 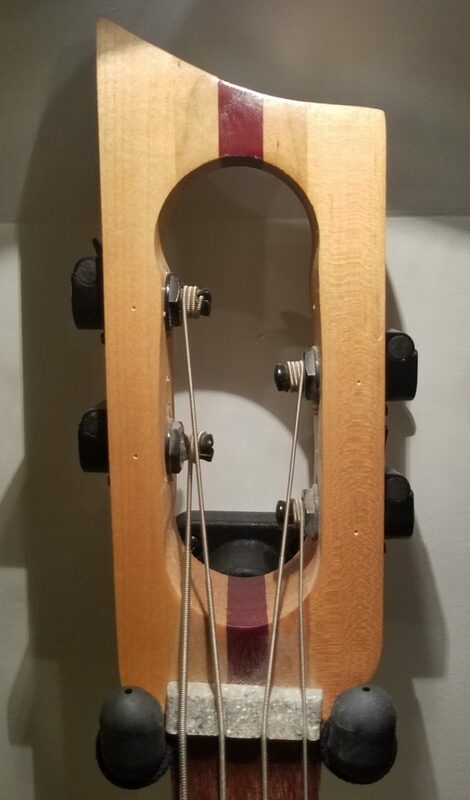 The only info on the bass was the label that you see in the picture to the right. 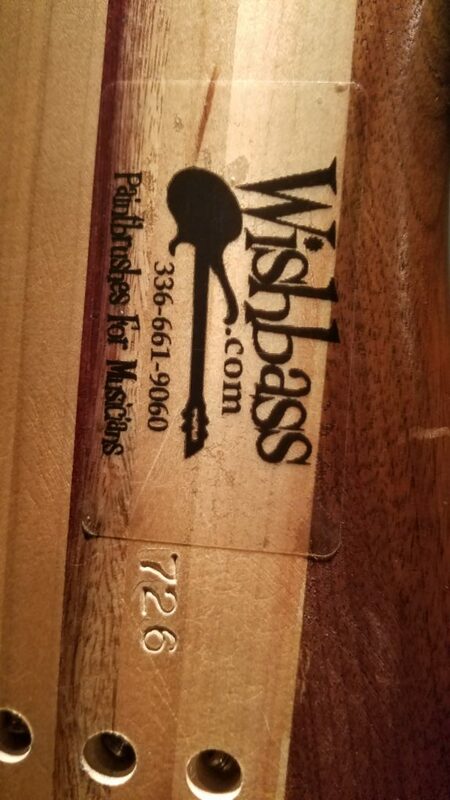 Jumping on the Internet, I soon discovered that the Wishbass company was down in North Carolina, and looked to be a one-man operation. “Hi, Teaj. That bass is called the “Kewel”. #749m. 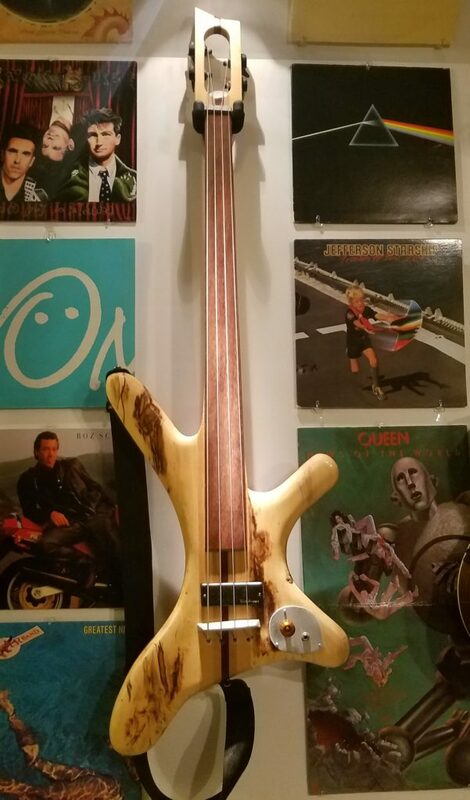 It’s some oddly variant bass made out of maple wood. Production: Sold on eBay on 5-9-07. That was a good design – comfortable. It was hard to ship though, and wasteful of wood. So that was my first encounter with the wizard behind my head-turning bass. He’s the one daring design dude behind all the quirky, morphing bass bodies that come out of the Wishbass shop. His name: Stephen Wishnevsky. In researching him and his company further, I’ve come to think of him as a cross between Uncle Si of “Duck Dynasty” and “Doc Brown” from “Back to the Future” – a curious, tinkering, jokester of a cuss that just can’t stop tryin’ different woods, electronics and hardware together in unexpected and, sometimes, outlandish combinations. Before that, though, he had quite an apprentice era learning this craft. He studied with the Ovation company, as well as several other well-respected luthiers, to gather the skills needed to open his own shop. 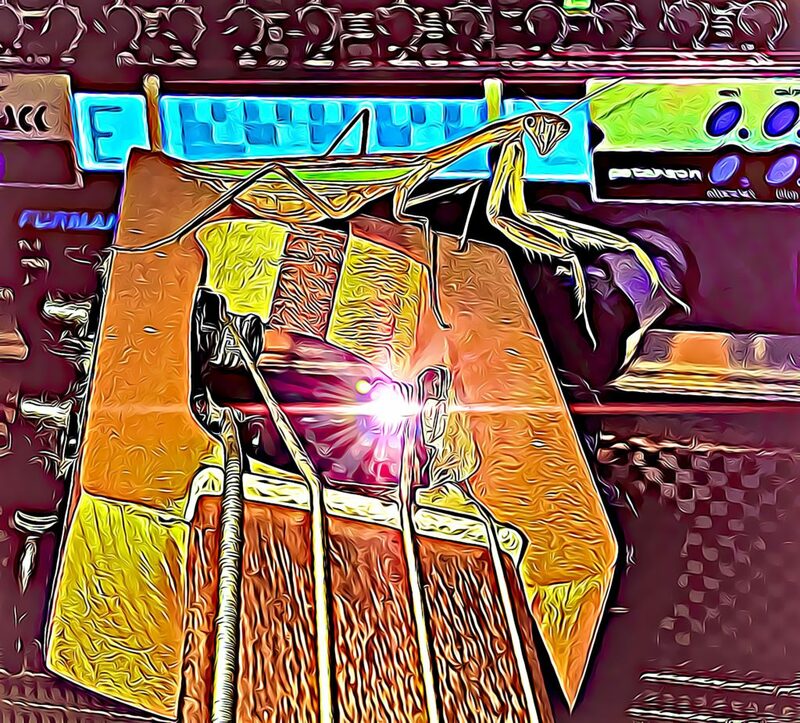 These days he’s moved on beyond Wishbass, and now you can find him making all kinds of stringed instruments that, again, buck the trends of current accepted instrument design. Guitars, harps, mandolins, resonators and mixed hybrids you can now find on THIS WEBSITE. “Our basses are designed to maximize the acoustic coupling between the strings and the neck/body wood. This produces a fine woody tone and lots of sustain. I’d have to say that from what I hear of my own Wishbass axe, he’s hit the nail on the headstock. 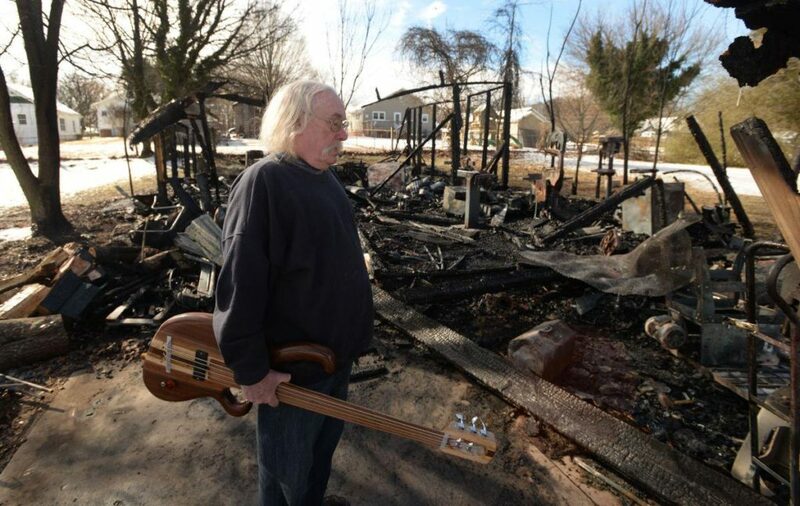 In February 2015 the Wishbass shop burned to the ground. Everything he had in the shop was destroyed… and even his TRUCK! Investigators concluded that it was a loose pipe or flue from a wood stove that caused the fire. How awful. It goes without saying that it hit him financially, but it was worse than usual: The flames engulfed thirty guitars that he just handmade and was going to sell, AND he was, unfortunately, UNinsured. Because he made his instruments in the garage-turned-shop on his personal property, he couldn’t insure the business, since personal real estate is zoned for residential, not business. 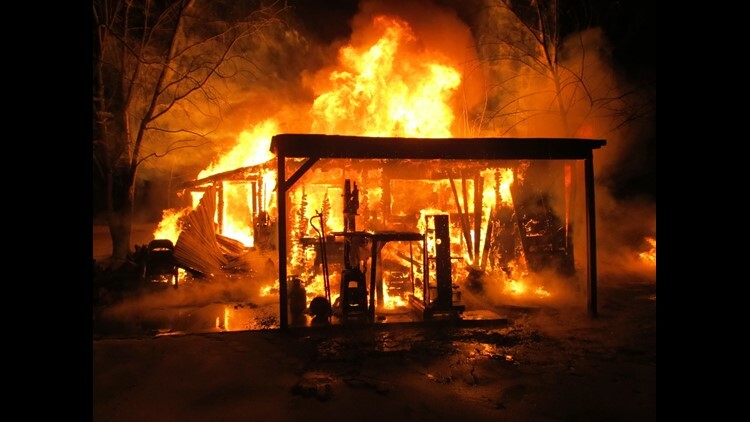 Not the legalese you want to hear when you’ve just witnessed your business go up in flames, I’m sure! And just think about all the other stuff he lost that had sentimental value. He’d created instruments in that shop for over 20 years! He found, for example, in the ashes the twisted remains of his dad’s old toolbox that he used to store tools. Things like that are just irreplaceable. Steve surveying what’s left after the fire. It really makes ya feel for the guy. Steve is once again up and running, having opened a workshop in the basement of a former furniture warehouse in downtown Salem, North Carolina. Best of luck in your new digs, Steve! May hundreds more instruments find life through your hands! Not everyone is a fan of Steve’s work though. You can find plenty of naysayers about Wishbass basses. But then, the products of any instrument manufacturer is put down by somebody. Roxie doesn’t seem to mind that there’s no truss rod. One thing that is true of standard Wishbasses though is this: they have no truss rod in the neck. 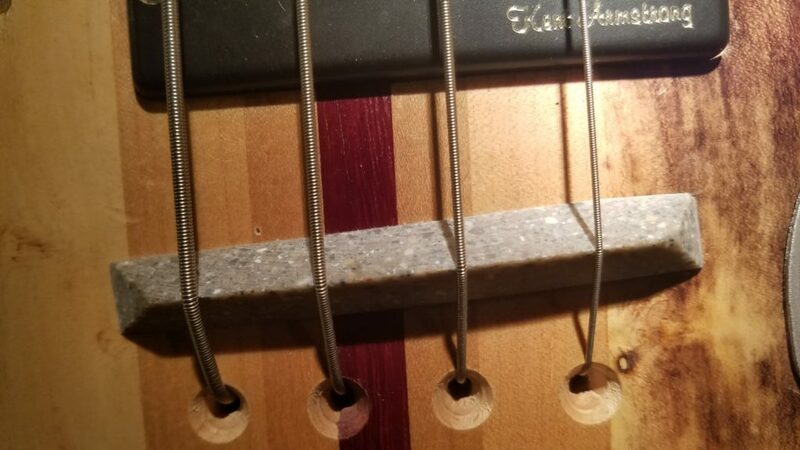 For some, having no truss rod is unacceptable. Me personally?? 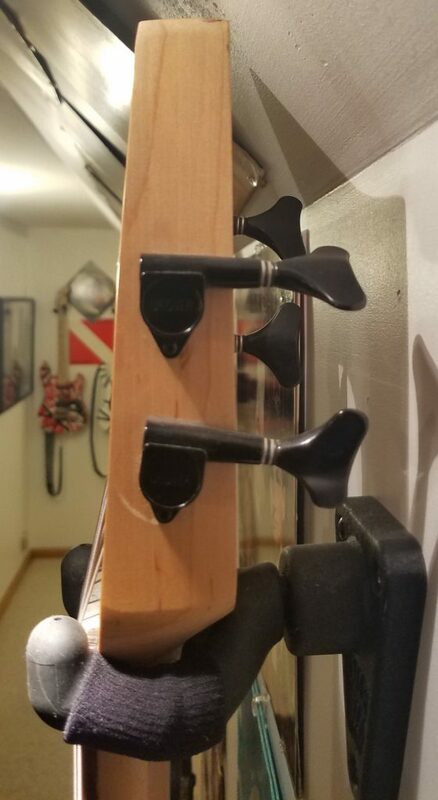 I’ve never had a problem with my Wishbass neck. It’s been consistent and straight with no changes for years. Yes, the neck is kind of fat. No, there is no truss rod. There is one reason for both of these quirks – I am convinced that putting metal in a guitar neck hurts the sound. As you can tell, this is a guy that knows what his business stands for, and unapologetically adheres to the mission! Is it true that some Wishbasses have come to customers with some “rough edges”, compared to high-end and well-known guitar manufacturers? Yep. But, again, consider what you get for the price point. A Wishbass may need some “finessing” to get it to your liking after purchase, but it’s always going to arrive sounding good from the get-go. Steve says he wants the instruments he makes to sound good, not necessarily look perfect. 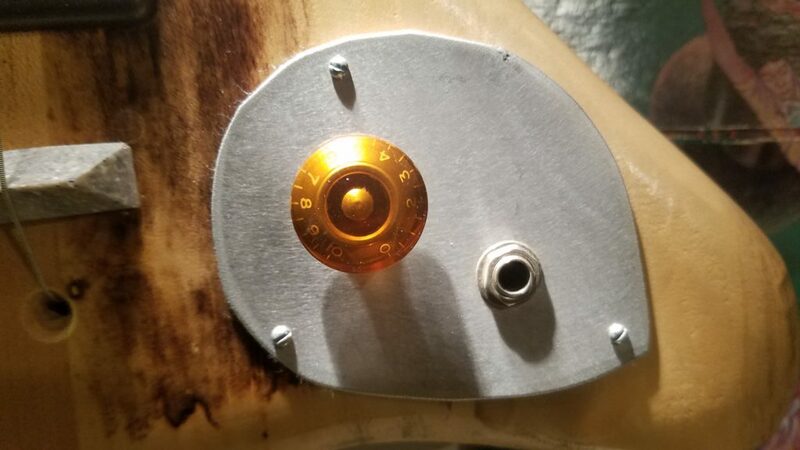 Some Wishbass customers online say they’ve had to replace, refine or recarve some piece of their bass after they bought it from Steve to get it to look like they want. Okay. Personal preference. But the sound you get makes up for what’s lacking in fashion. Interestingly, the customers that DID change these things still appear to be fans of Steve and often buy multiple basses from him. It’s like they realize that Wishbass gives them a good starting product, tho’ imperfect some of the time, for a price that’s just… well, stupid cheap. In other words, when you’ve saved so much money on an instrument you can afford to shore up a few niggling shortcomings here and there, or add bells & whistles if you want. Precise & easy to turn tuners! I get the sense from Steve that he’s really more into exploration, forging new ground and making something new than being too particular about visual Q.C., so I’m not surprised that these issues come up from time to time. This lines up with Steve’s M.O. – “I make affordable string instruments for the working musician.” He usually, for example, puts very little coating or lacquer on the wood at all. Sometimes none! Why not? Because it’s not necessary to get good TONE. Also, you won’t find his instruments in the big box music store catalogs. Why? It helps keep costs down, the savings of which he can then pass along… to you. 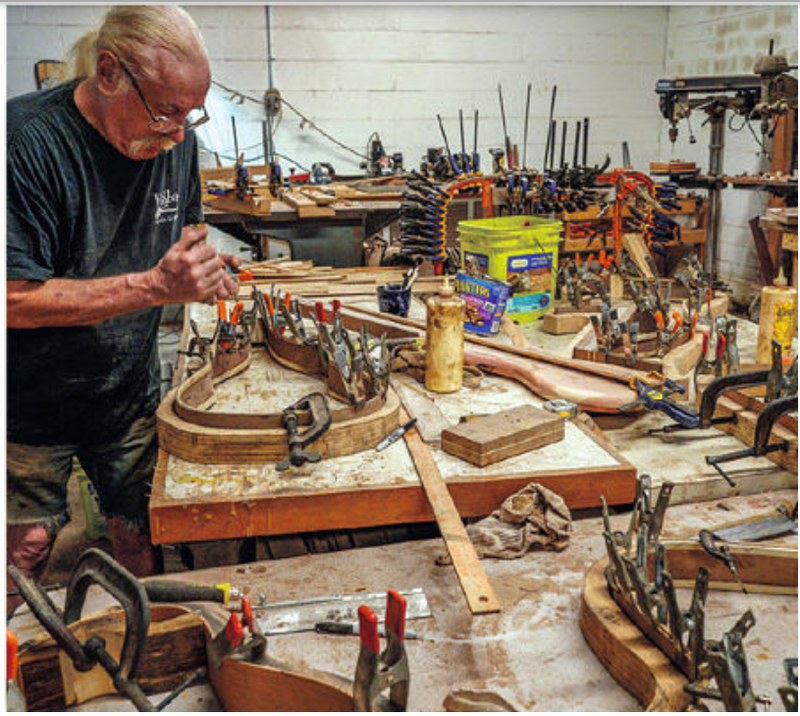 Though I haven’t actually gone down and met Steve in North Carolina, the Internet shows that he spends a lot of time probing the boundaries of potential in his instrument making. Take, for example, THIS VIDEO. It shows just how interested and curious Steve is about expanding the possibilities in the marriage of music and electronics. I did a little recording for you of me messin’ around on ‘Meeb. It’ll give you good insight as to why I like it, and how solid of a sound it produces. I recorded with one mic pointed at my Ampeg cab. Amp was my Bugera Veyron T. Didn’t have it up very loud. About halfway. In playing this bass again for a few hours, I have to mention just how comfortable it is. The way Steve made the body it rests perfectly on my leg, and because the body isn’t too thin, like, say, a Stratocaster, my leg didn’t mind it being there for hours. Very easy to play and, though it admittedly looks strange, this bass is ergonomically the bomb! Enjoy this glimpse into my ‘Meeb world! Steve’s instruments aren’t for everybody. Some say they’re ugly. Some call ’em “unfinished”. Some label ’em sub-par. Others say they’re bizarre. For those of us that play a Wishbass, however, we find them to be solid, dependable basses with deep, woody voice, admittedly basic, but full of great tone and substantial sustain. 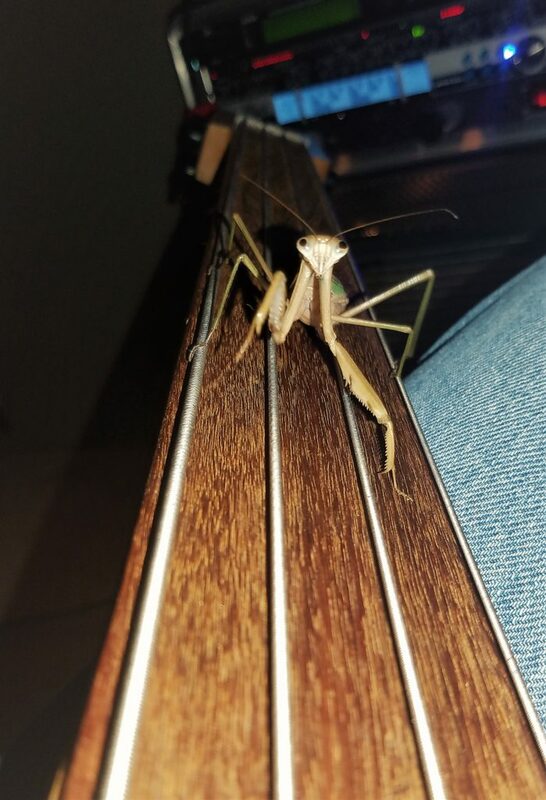 My mantis Roxie really digs the Wishbass!! For me, the tone and response I get from my fretless Wishbass is great. I haven’t had to change the bridge for intonation problems. I haven’t had to sand down any parts of the neck to get the radius consistent. I haven’t needed to change anything… ‘cuz it’s a solid workhorse as is. Yes, it only has one sound. But that sound is solid and exemplary. Just what I need in the studio when a fretless bass part is needed. It records wonderfully. And yes, it looks totally bizarre. But when I’m recording, that doesn’t matter. If the tracks sound good, I’m happy. And so far… Meeb gives me everything I need! Wishing for an inexpensive way to get into a big-bottom bass?? Try Steve’s instruments. If their unique look isn’t your thing, that’s fine. Not all art speaks to everybody. But if you DO try one of these handmade, one-of-a-kind instruments, you just might end up a groovin’, satisfied customer. Glad you liked so much on our site. Drop by anytime! 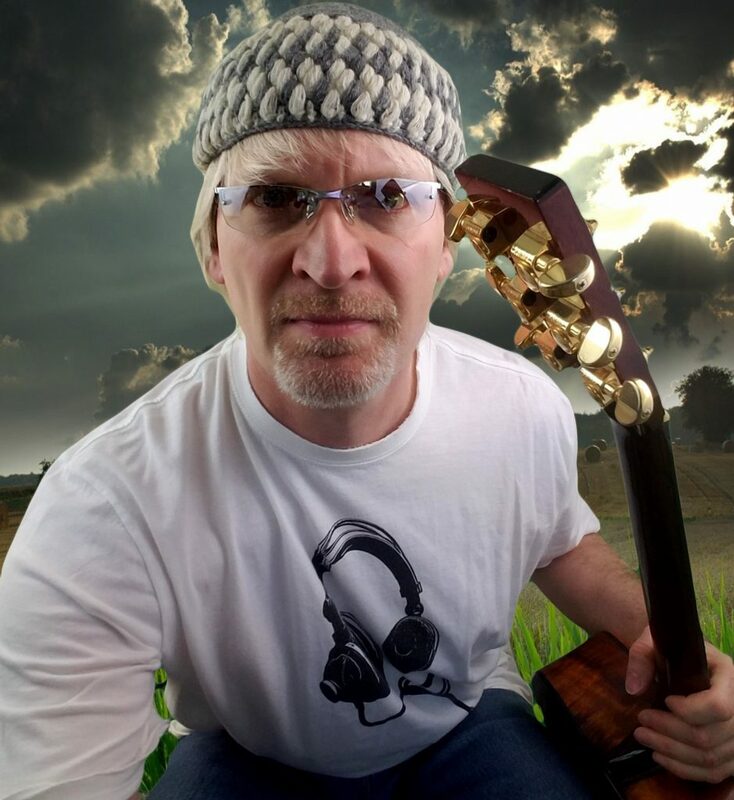 Hey Teaj – well I never – I haven’t heard of a wishbass or experienced the sound one makes when played, but absolutely loved reading all about it and watching the video of you playing it and your chat with Gear Hounds. And as for Steve – that man rocks and has the right attitude to life! I was wondering which other instruments would go well with a wishbass to create a melody, as well as complementing its unusual shape? I personally think it would create a fun musical experience if a group of musicians mixed a range of out-of-whack instruments orchestrated sounds which one could not quite pinpoint and allow the audience to be captivated as they tap into a mysterious flow of sounds and shapes. I spoke to Stephen one day about the bass. He couldn’t remember exact pricing. The thing is with him, though,… his whole goal is to get instruments into the hands of people who want to play for as little money as possible. That’s why he doesn’t make every instrument as “perfect” as the major manufacturers. That would take too much time per instrument and he’d have to raise his costs. You should try bass!! It’s a ton of fun and really inspirational if you come up with parts yourself. I always play the bass lines on my albums just for that reason. Get a cheap bass (from Stephen??) and then start with THIS POST. Great to see you here again, Chris! Stop by anytime!! I’m not a bass man – never have been (not enough going on with it for me! ), but I’ve always had a soft spot for strange guitars. Actually, it doesn’t even have to be the shape – I’d buy a guitar if it was bright pink just because it was different. It’s cool you managed to look further into the Luthier behind these diverse instruments and find out what drove him into these designs. I’m wondering what the original price of the axe was, considering you only paid $130 for your second hand model?